Full catering available, club house with changing rooms, pro shop with club, trolley and buggy hire. 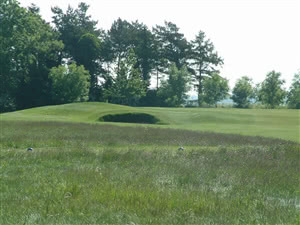 Naunton Downs course plays over beautiful Cotswold countryside. A valley running through the course is one of the main features, creating one par 3 hole that crosses over it. The prevailing wind adds extra challenge to the par 5's (which play into the wind), combined with small undulating greens. We played this as part of a golf weekend away in the cottswolds on day 1. A pleasant course overall, mostly on higher ground with good views and wholesome country smells throughtout. We all played very well for our handicaps that day which is rare. Unsure if the comp brought the best out in us or the course was easier than some. Very enjoyable either way and will return. Putting green has pitching area built in and a good practice field too. 19th hole was the pub in Naunton so can't comment on clubhouse but seemed very nice.